We believe in offering our clients choice; when it comes to planning your party we can advise you on the right package to suit your choice of venue, guest numbers and budget. Euphoria Entertainments have a selection of packages; these can be tailored or changed to meet your individual requirements. This is our starter package, suitable for the smaller or more intimate party, perfectly suited for up to 75 guests. This is the most popular package we offer, it is suitable for a medium sized party with guest numbers ranging from 75-150. This Ultimate Package is for the larger venue or marquee party with 150+ guests. The package expands further on the Silver by the inclusion of our largest RCF Line Array speaker system. We have upgraded the lighting fixtures, included 16 LED wireless room uplighters and added our fabulous dry ice machine for your “dancing on the clouds” experience. Just tell us what you need and we will be delighted to provide a bespoke quotation. Can we meet you prior to our party? It is not necessary but it is recommended. A pre-wedding consultation is a great opportunity for us both to meet, it gives us the chance to discuss your requirements and ideas that you may have for your big day. Do you visit the venue beforehand? This is not necessary, with many venue’s now having interactive room plans on their website we can look and see room layout, sizes etc and advise on a package to suit. Yes, we have full Public & Employers Liability Insurance, a copy of which is available on request. Can I provide a playlist? Of course, we can play any music that you require. Our database of over 35,000 songs means we have the most popular requested tracks, however should we not have your favourite we can source 99% of all music using our online suppliers. We are happy to accommodate any requests or tracks that you may require for your party, you can either provide them directly to us or send us a playlist via e-mail. We can source tracks for you using our online music suppliers. All tracks we obtain will be high quality digital FLAC variants for optimum sound quality. How do I book and do we pay a deposit? Once we know your exact requirements, we will provide you with a quote. A £50.00 deposit will be required to reserve your date, once this has been received your booking is then confirmed in writing. Do you have a limit on travel? We are happy to attend any venue; however, should the venue be in excess of 25 miles outside of Westbury then travelling costs will be factored into your quote. Why should I book a professional DJ for my party, isn't it just an iPod these days? Does your iPod read the atmosphere and react to the crowd? Your wedding is one of the most memorable days of’ your life and the evening reception is a big part of that experience. 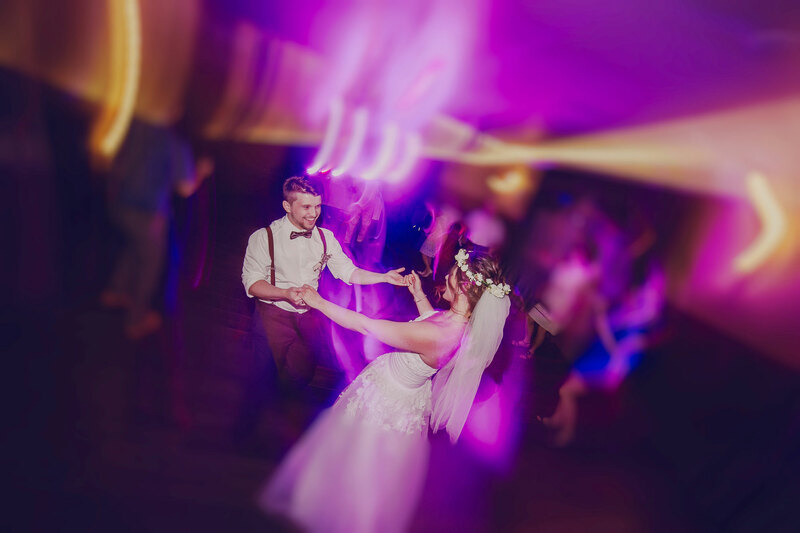 We have been in business for over 18 years and have a wealth of experience in providing quality DJ entertainment using the latest professional equipment. Can you set up early? If required, we can set up the equipment before your wedding guests arrive. This takes away the worry of possible noise and interruption and gives you the reassurance that all is prepared for the evening. What if I want music throughout the day? We can provide background music during the day if required. This is ideal if you have an all-day wedding and would like some quiet ambient music to fill the room, We can also provide microphones / PA for the speeches should the venue not have in house facilities. Can we party all night? All packages include a DJ set which ends at midnight, should your venue allow you to continue your party late into the night we can accommodate this. An hourly rate of £95.00 applies after 12.00am. The latest we will continue the set is 2.00am.